It was a weekend of doing something new and doing activities we’d been meaning to repeat for some time but never got around to. The ‘something new,’ was eating lunch at Izela in the village of Kayaköy. The repeated activities were additions to our hiking and walking in Fethiye page. We walked to Cold Water Bay after our Izela lunch. Our second hike, a couple of days later, was along a famous stretch of footpath; we did the hike from Ovacık to Faralya along the Lycian Way. We took the dolmuş from Fethiye, as far as the entry road to the Montana Pine Resort in Ovacık. This was our starting point. These days, the start of the Lycian way has been brought to Fethiye, making the total route a few kilometres longer but the original, official start was this entry road. And the sign announcing the beginning of the historic trail is still here, too. It feels quite ceremonial starting from Ovacık – like you’re about to tackle something special. And you are about to tackle something special. 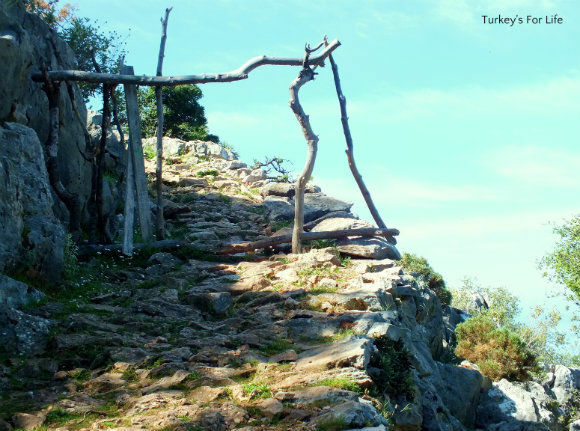 The hike from Ovacık to Faralya is described by some hikers as the most beautiful stretch of the Lycian Way. There are three roads here, at the beginning. This was our first hurdle – one of the minor pitfalls of hiking in Turkey. Which road to take? We know to follow the red and white striped waymarkers but we couldn’t see one at first. Obvious once you do spot them. There it is, painted on the righthand pole of the Start sign. We took ourselves off along the road on the right. It’s a gentle start on the trail from Ovacık to Faralya. We’re already quite high up above sea level on the flanks of Babadağ mountain and it’s not long before it’s time to get the camera out. 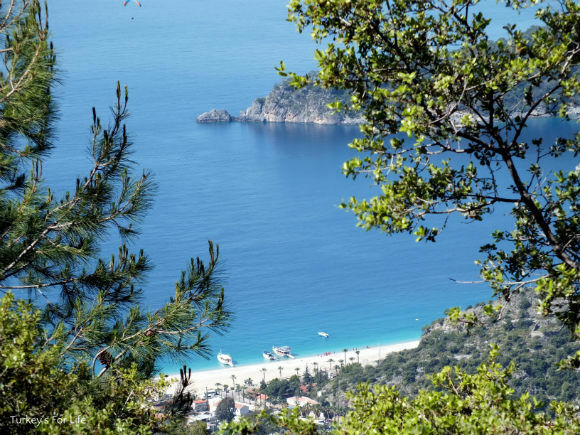 A beautiful vista of the beach at Ölüdeniz through the trees. Paragliders were descending and swirling around us and we could hear the squeals of delight / fear from those coming down in tandem with their pilots. The beach below was deserted and idyllic. A Monday morning at the beginning of springtime. Of course it was deserted. The road eventually gives way to rubbly track but we weren’t quite in the wilderness just yet. The gentle ascent, wide track and more-than-pleasing scenery mean this little stretch is popular for picnics. And you can see why. Grassy knolls, rocky outcrops, St. Nicholas Island (Gemiler Adası) in the distance and the vast expanse of the Mediterranean Sea. This was excatly how we’d remembered the walk from previously. We’d purposefully chosen a sunny spring day again – clear views and pleasant temperatures for hiking. Lush greenery from the winter rains and wildflowers and budding blossom on some of the trees. A bit more (relatively) gentle ascent and now the views of the whole stretch of Belcekiz Beach, Kumburnu and the lagoon at Ölüdeniz were opening up below us. This is the point where most picnic people put the breaks on. From this point on, the hike from Ovacık to Faralya becomes more strenuous. The Lycian Way becomes steep, rubbly track and this is where you start to feel like you’re on a real hike – just you and your scenery. Blissful. 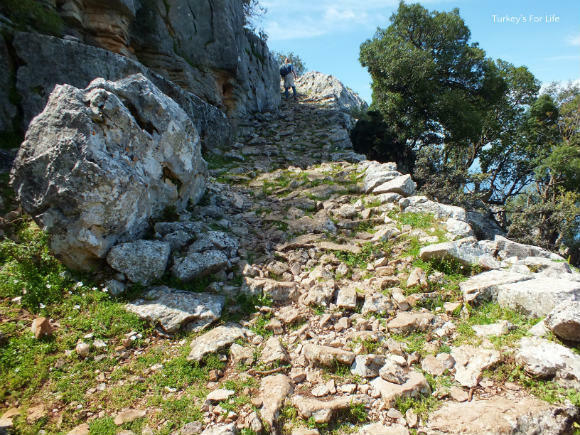 The hike from Ovacık to Faralya on the Lycian Way is no gentle stroll in the park. As we continued to climb, just a few trees clinging to the cliff face were all that separated us from the sheer drop down to the Mediterranean, hundreds of feet below. It was a mixed feeling of exhileration – we love a good hike – and a touch of trepidation. We kept as close as possible to the rock face to our left. Wonder why someone chose to get creative up here? At one point, someone has decided to get creative with branches from trees by building an arch. It’s significance escapes us but it’s a reminder that so many others have been here before us. Well, the Lycians and the Romans for starters. But the hike from Ovacık to Faralya is also a modern day popular stretch of the Lycian Way. At some points, where waymarkers disappear, you’ll be able to spot occasional (unofficial) painted arrows and spots. These are helpful reassurances that you’re not heading off up some random pathway getting yourself lost! Higher and higher we climbed. Had we somehow blanked the climbing distance out when we were remembering our first Ovacık to Faralya hike? We’re much fitter these days from running and we were making good time – my usual regular pit stops weren’t necessary. But this is still a real pull. …Hello forest and mountain goats. And still we climbed. The goats were ever present companions. Different herds of goats, that is. They’re all too busy munching and clambering around the rocks to take any notice of human hikers! If they were blocking the footpath, it wasn’t that they were fleeing as we approached. They just stepped aside without even acknowledging us. Leaves to eat and all that. It’s in this forested section of the hike from Ovacık to Faralya that we encountered a couple of forks in the path, here and there. One direction is the Lycian Way, one is – well, who knows? Keep your eyes peeled if you do this walk. Sometimes, you’ll need to go on ahead for a few metres and do a little scout mission to look for waymarkers. Like we said, they’re obvious once you’ve spotted them but they can be elusive! And then, just as we were beginning to feel that we’d never reach our particular plateau on the slopes of Babadağ, the strain on the legs disappears as you finally reach a section of flat footpath. Ahh, so lovely to be up high in the mountain air. We followed the path, sometimes flat, sometimes undulating, through the small hamlet of Kozağaç and towards the village of Kirme. The first time we did this walk, these were the places where we knew we’d find springs to top up our water bottles. These days, there are a couple more springs and you’ll also find the odd place selling fresh fruit juice, water and gözleme. Don’t skip out on these parts. Do top up with water! We filled our bottles via one of the gurgling springs. That’s why we prefer springtime hiking. If there are springs around, they’re more likely to be gushing with clean fresh water from the winter rains and snow. After passing some semi-built villas (yes, in the middle of nowhere, three quarters of the way up a mountain) that were in the same state the first time we walked the Lycian Way from Ovacık to Faralya, and ambling through Kozağaç, we again climbed a steep road to reach Kirme. It’s here where you’ll see that you’re nearly at your destination. Just 3km to go. We can tell you, we both run 10k quite often. We’d just hiked 10k. The hike was tougher. The last 3km is pretty much downhill – but it’s still rubbly and steep in places so it feels like quite a long 3km. Gives the knees and thighs a good workout. As you make your descent, you’ll see another Lycian Way signpost to continue towards Kabak. This is another 7-8km further on and we had tired legs so we opted to continue our descent to Faralya. Still keep your eyes peeled around here. Turkey has a penchant for building roads and tracks and there’s a few places where there are three and four-way splits in the road that were not there last time we did this hike. As we said above, the red and white waymarkers are there, you just need to scout for them. Helpful hikers who have done the route previously have also built small cairns. We added our own rocks to these as we passed by. Eventually, our path started to follow a stream and we immediately remembered it from our last hike. We were nearly at the main road which runs through Faralya. The signposts for motels that we’d seen en route disappeared and the actual motels in Faralya began to reveal themselves. Ahh, nearly there. We had three hours to kill before the last dolmuş back to Fethiye (the dolmuş was still on its winter timetable) but that wasn’t going to be a problem. We’d arrived at our destination. The Lycian Way footpath delivers you to the main road through Faralya right at the point where you can grab yourself some amazing views of Butterfly Valley. A couple of photos and then straight onto the terrace of one those roadside motels for a late lunch and couple of welcome ice cold beers! Below is an interactive map of the Lycian Way route for the hike from Ovacık to Faralya. This was done by phone GPS and should only be used to give you a rough idea. The red and white striped waymarkers are your friend on this hike! You can zoom in and out. If you click on the top right icon, you can also view the larger map and change the terrain. If you click on the route, it also gives you distances and elevation. And below is a basic diagram of the elevation on the route showing the 713 metres total climb. The highest point you reach is 804 metres at around the 6km mark. 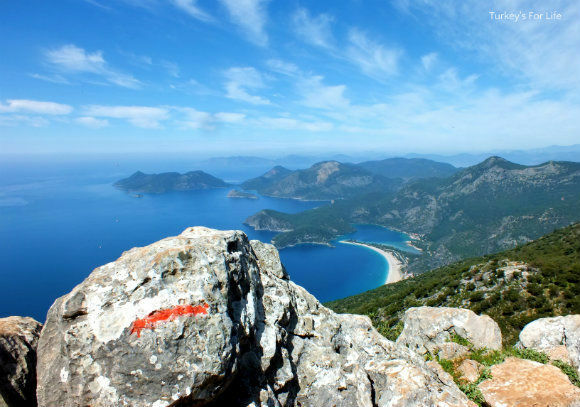 The hike from Ovacık to Faralya is the most strenuous hike on our Fethiye Walks page. If you want to do a walk but want something a bit more palatable, take a look at our other ideas for walks and strolls around the Fethiye area. You’ll also find a link to some useful safety tips if you are heading out into the hills. You are responsible for your own safety when hiking! Please do your route research and take all necessary safety precautions when out in the hills. The Official Lycian Way book will also come in handy. This is a strenuous hike that shouldn’t be tackled unless you are relatively fit. If you are doing the Ovacık to Faralya hike as a day walk, without large backpack, allow 4-6 hours to complete it, depending on rest stops. It took us 4 hours with just a few stops for photos and to take a drink. The hike from the Ovacık start point to the road in Faralya is 13.5km with a total ascent of 713 metres (as mapped by Runkeeper). Once you leave the road, the terrain is rough underfoot. Make sure you have walking boots or, at least, trail shoes on. A hat and long sleeves and trousers are a good idea, too. Lots of exposure to the sun and also a few shrubby areas where you could get cuts and scratches. You will need at least 1 litre of water per person to get you up the mountainside – this is a steep uphill stretch of footpath that goes on for 4km. You can then replenish your bottle at the springs in Kozağaç and Kirme. If you’re hiking in summer or early autumn before the rains come, these springs could be dry or trickling so carry more water with you. For us, personally, this is not a hike we would tackle in summer. 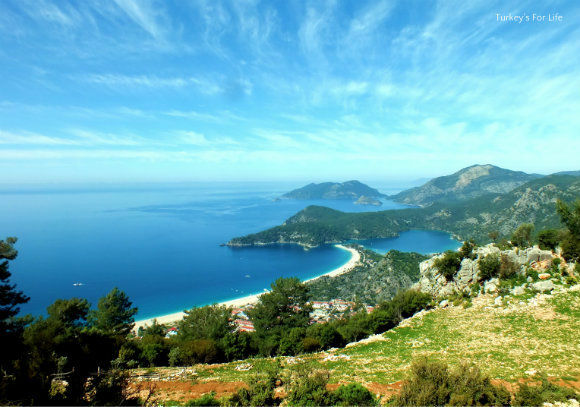 The Ovacık to Faralya stretch of the Lycian Way is also a honey producing area. You will come across bees and bee hives. We walked in springtime so were accompanied by the sound and sight of honey bees the whole way as they swarmed around the tree blossom. They were very busy and didn’t bother us but just be aware they’re there. Once you’ve finished your walk, you can either stay over in Faralya or Kabak or you can take the dolmuş back to Fethiye. The dolmuş goes via Ölüdeniz, Hisarönü and Ovacık. If it’s summer – or you’re just not into hiking – and all of that seems too much like hard work, here some other tips for things to do in Fethiye. For great views with accessibility you are right, this is a walk that takes some beating.